ATTO is one of the oldest drive benchmarks still being used today and is still very relevant in the SSD world. ATTO measures transfers across a specific volume length. It measures raw transfer rates for both reads and writes and places the data into graphs that can be very easily interpreted. The test was run with the default runs of 0.5KB through 8192KB transfer sizes with the total length being 256MB. Benchmark Results: ATTO showed Kingston V310 960GB drive maxing out at 552 MB/s read and 489MB/s write in the standard overlapped I/O benchmark. This drive is rated at having up to 450MB/s read and write on ATTO where most of the data is compressible. It looks like the drive is running well beyond the advertised ratings so far. CrystalDiskMark is a small benchmark utility for drives and enables rapid measurement of sequential and random read/write speeds. Note that CDM only supports Native Command Queuing (NCQ) with a queue depth of 32 (as noted) for the last listed benchmark score. This can skew some results in favor of controllers that also do not support NCQ. 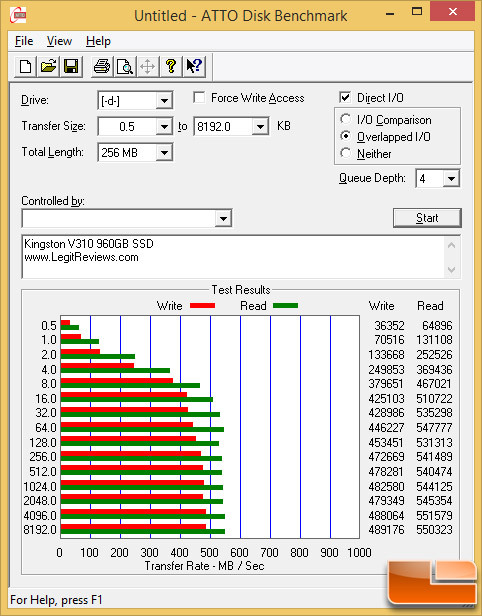 Benchmark Results: The Kingston V310 960GB SSD scored 531.7MB/s read and 486.6MB/s write on the sequential test when we ran the drive on the CrystalDiskMark storage test with the default settings (incompressible data). The 4K scores were a not so impressive as it topped out at 10.5MB/s read and 55.32MB/s write. We also ran the 0x00 (0 Fill) test (compressible data) and found that the sequential read/write performance of the drive was about the same; 536MB/s read and 474MB/s write . It looks like this drive favors compressed data when it comes to 4K performance as our scores jumped up to 69MB/s read and 108MB/s write.